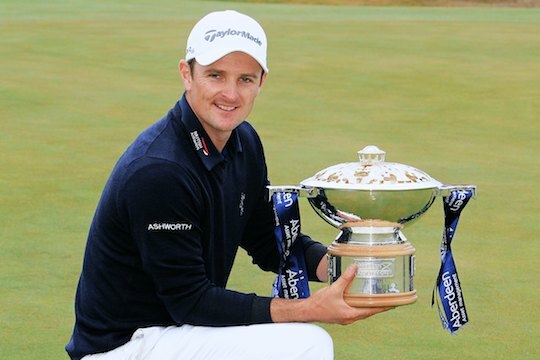 Justin Rose has put himself into favouritism for this week’s Open Championship following his convincing Scottish Open success at Royal Aberdeen. Rose was in a class all of his own posting a final round six under par 65 to win by two shots with a 16-under par victory and his 15th victory worldwide. The Englishman, who will move to a career-high of number three in the world, also captured a rare PGA Tour and European Tour back-to-back victory double having won the Quicken Loans National in his last event before a first-ever success in Scotland. “It’s unbelievable, to be back in the winner’s circle so quickly,” he said. Rose earned €627,020 for his victory that has seen him jump to seventh on the Race to Dubai with earnings this European Tour season of €1,153,622. As well, victory has guaranteed Rose a place in September’s European Ryder Cup team. Sweden’s Kristoffer Broberg shot a 66 to finish runner-up at 14-under and secure a place into this coming week’s (British) Open and what will be his first Major. “I played all right actually, like a couple of months now,” he said. “But my short game is so much better right now. I’m just pleased to be in The Open and play my first major. Scotland’s Marc Warren (70) was third on 11-under par while fellow Scot Stephen Gallacher shared fourth place on 10-under with a new joint course record of a nine under par 63. Joining Gallacher in setting the new mark, and three days after Rory McIlroy shot a 64, was Chilean Felipe Aguilar. Wade Ormsby finished the best of the small Australian field in equal 51st with PGA Tour regular, Matt Jones, sliding in to last place with a final round of 80.